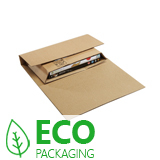 These brilliantly designed econobook boxes with adhesive strip are simple to assemble, quick to use and represent superb value for money. With extended corners for extra protection, a strong and secure self seal strip and built-in creases so it will fold down to the height of its contents. Getting your books, CDs and DVDs securely packed and safely delivered to your customers couldn’t be done much quicker or much cheaper than by using our self seal econobook boxes. Five sizes in stock from A5 up to A3. Made from sturdy reinforced and recycled corrugated board, even more strength is guaranteed thanks to their extended corners. These adhesive stripped econobook boxes are among the cheapest book packaging products we supply, yet they still provide the level of protection we know you want. A series of built in creases means that the board can be easily folded to suit the different height of the books you are posting from 10mm up to 60mm. Will e-readers spell the end of the traditional book? We don't think so!